With failing revenues from its two primary online commodities, the Lehigh & New England Railroad ceased operations on October 31st, 1961. Equipment was sold and abandonment and removal of most of the trackage commenced soon after the end of operations, except for the still somewhat profitable cement region. The roughly 40 miles of remaining trackage in the cement region would be operated by several railroads from 1961 to present. 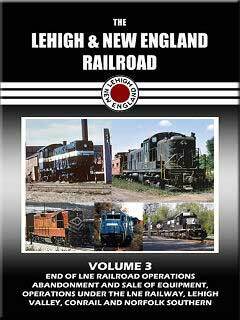 In volume 3, we'll follow the transition from the end of Lehigh & New England Railroad operations, into the Lehigh & New England Railway, Lehigh Valley, Conrail and present day Norfolk Southern operations. Fred (Tuscola, IL) on 2013-04-27 06:54:20.